Here at the Swift Agency, one guy that already has more ideas than hours to write in the day, we’re happy to report stuff back to you but we also know you prefer to be warned if it’s a spoiler. So this might be a big spoiler or it might not and you might want to avoid reading this post. The Sparkly Dressed seems to be keen on the idea of bringing back one of her old classic songs during the acoustic set. Hear ye, hear ye. Spoilers ahead. Turn back now. Last night it was a hit song from her debut album. The single “Should’ve Said No” from her album Taylor Swift which she used in the past to close the Fearless Tour (remember the waterfall?). As the Forever and Always Fearless One strummed the guitar and sang the familiar words it was amazing to hear the audience at the Scottrade Center in St. Louis, Missouri still remembers this song. Although the review at the St. Louis Post-Dispatch highlights the heavily produced numbers, they do get one thing wrong – the production is great but a lot of us fans live for that acoustic set. Inadvertently, they give away a little of the songs to come with the set list obtained from T-Swizzle’s management. “15”, “White Horse”, “I Almost Do” and “Ours” are alternatives for the B stage. However, last night it was an even older song and we’re happy about it. March 19: The Red Tour at Scottrade Center in St. Louis, Missouri. On sale now. More information on Ticketmaster. March 22: The Red Tour at Time Warner Cable Arena in Charlotte, North Carolina. On sale now. More information on Ticketmaster. 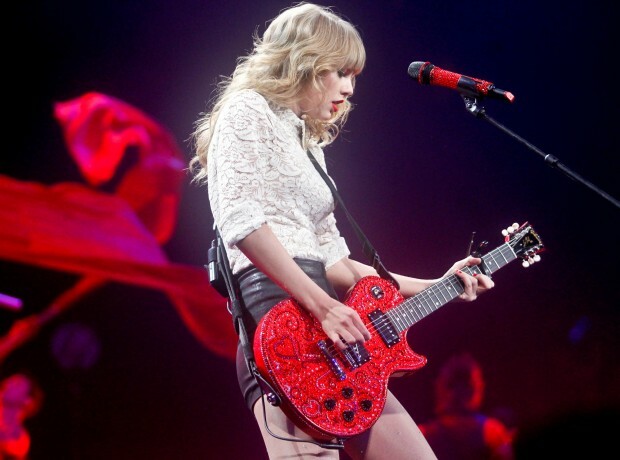 March 23: The Red Tour at Colonial Life Arena in Columbia, South Carolina. Goes on sale on February 1st. More information at Colonial Life Arena. March 25: Fan voting starts for the 48th ACM Awards Entertainer of the Year. Taylor Swift is nominated! The Red Tour twist on arm lyrics! Are you going to keep a list of dates and the rotating song? I was stalling while I was getting this done. Yes! Check the latest post and The RED Tour Arm Lyrics under the Extras section. Previous Previous post: The Princess in Red will perform at the 48th ACM Awards!